In many ways, these first seven verses can sum up a lifetime of knowledge for us, if we just take the time to learn these verses. Intelligence can be learned in many ways. You can learn it in school, in reading, in study, and just by living in the world. But true knowledge to me comes from wisdom, from knowing what is smart and what isn’t, from understanding those words of insight. In particular, I like the final verse, verse 7. The fear of the Lord is the beginning of knowledge; fools despise wisdom and instruction. What is your take on the book of Proverbs? Tell us below in the comments, and thanks! Will you commit to studying Proverbs with us? Now, please pray with us the prayer requests and praises we have lifted up this week. Mikel starts us off with a prayer request for her sister, Saundra: I would like to ask prayers for my sister Saundra who is having knee replacement surgery this week. The surgery had to be postponed a bit because of some tests, so please pray for those tests to stabilize so this can get taken care of. Lori has a prayer request: I may have an interview this week. They wanted me to come on Thursday but my boss’s wife is having surgery that day, so I have to be in the office all day. I emailed them back asking if they could see me either tomorrow or Friday (with the reason I could not meet them Thursday). That was late in the day today…..no word back….keep me in your thoughts and prayers. Kipp has a prayer request: Guys I have a childhood friend that needs prayer. His name is Len. He is having his kidney removed tomorrow morning. That kidney is so full of cancer. Can we pray for no complications, a rapid recovery, complete containment for the cancer to just that kidney, and wisdom/clarity for those giving him care!! UPDATE: Just literally walked back in from hospital! They are saying ….he is cancer free…. it was confined to the kidney….praise God!! Linda has a prayer request for her husband: My husband has been receiving treatment for years for a-fib (irregular heartbeat). He had open heart surgery and a valve replacement 11 years ago which helped tremendously. Today, his heart began beating extremely fast and he is now scheduled for a cardioversion (electrical shock to the heart) on Thursday to restore its natural rhythm. Prayers that all goes well or even that his heart regains its normal rhythm on its own before then would be greatly appreciated. Update: My husband Dan came through the procedure just fine this morning and is back to being himself. (He even cut the grass this evening)! Now our prayers are that it will “hold”. The doctor said that sometimes this fixes the situation for several years … or it could be for just a few days. Naturally our prayers are that the “correction” will last. Thank you all so very much for your prayers. Jodi has a big praise! My brother Ken is scheduled to go home on Monday afternoon! Will have oxygen and nebulizer as he works on strengthening lungs. He’s been so bored at the hospital & rehab. He’ll be so glad to be home!!! Thanks you for and please continue the prayers! Lastly, thank you to those that prayed for the Raleigh, NC area during their huge rainfall totals last week. Things have settled back down after over 8″ of rain in some areas. Do you have any prayer requests you want us to pray over? If so, please leave a comment below and we’ll pray for you! Now, please pray the prayer that Jesus taught us to pray. 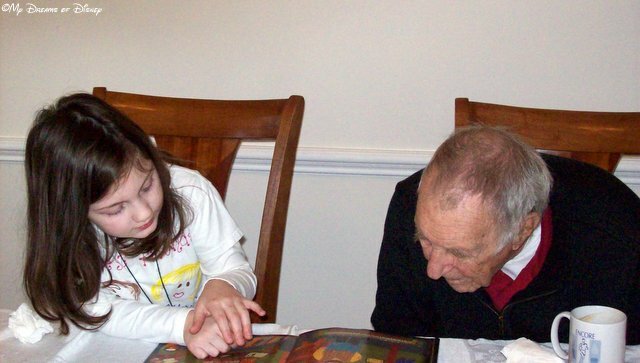 Sophie and Grandpa were reading a story together on Thanksgiving Day, 2008. Happy Thanksgiving from all of us at My Dreams of Disney! Today my family sits down for a good Thanksgiving meal with my Mom and niece and her baby girl. A lot of love goes into our meal prep, and on this day, we here at My Dreams of Disney want to take a moment and wish all of you a very Happy Thanksgiving. My prayer for all of you is that you are able to be with the ones you love on this day. For those of you that have to work, especially those that are in our law enforcement, EMS, and fire departments, you have our thanks. If you are traveling on this day, may safe travels be the rule, and may you reach your destination on time and without mishap. If you have to work because you don’t have any other choice, then you have my sympathy and prayers that next year you would have the ability and means to work because you want to, not because you have no choice. If you are a Cast Member at any of the Disney Parks, my prayer is that you would be treated with the respect you deserve, both from your boss and others in charge as well as by those Guests that you serve. Whatever you are doing, and wherever you are, may we all remember that there are those that are so much less fortunate than we are, despite our circumstances, and may we all remember that we are all human beings, and to treat ourselves with the respect that we all deserve and should expect. Lastly, my prayers go out to those in our armed services, but especially to those on deployment right now, and unable to be with us on these special days. Shane, I’m looking at you, and praying daily for you and your men. Hello my Brothers and Sisters, and welcome to this week’s Prayers for the Week post. Today we’re delving into the plan that God has for our lives. Do you ever doubt that God has a plan for your life? If you do, I hope and pray that the Psalmist’s words will answer that doubt in you. This Psalm is attributed to King David, a man who knew God very well during his life. This past Friday, of course, was the 9/11 Anniversary, and if there is ever a day for not understanding why things happen, it was that day. However, out of that incredible tragedy, that horror, the untold death and destruction came literally thousands of stories of one person putting themselves in a position to help someone else, a total stranger. In fact, there were even stories of dogs helping out their owners and those they don’t even know during this time. If you haven’t heard the story of Bretagne, go click the link and check it out. Out of all that, what I’m getting at is that, as hard as it can be to do at times, we need to remember that God has a plan for us, and He will take care of us, if we just let Him. Now, please continue reading and pray with us on our Prayer Requests and Praises. Please pray for our friends Regina and Steve. Steve had a bad flareup of his Crohn’s Disease, and may need to have surgery. Please pray healing prayers for Steve and prayers for Peace, Comfort, and Strength for both Steve and his wife Regina. Please pray for our friends Doug and Monica and their daughter Maddie. Doug needs to have hip replacement surgery on October 19th, so please pray healing prayers for him, as well as prayers for Peace, Comfort, and Strength for Doug, his wife Monica, and their daughter Maddie. Maddie, in particular, is sometimes anxious, so please especially pray for her. Continued prayers for Sebastian and Sherry, as well as for Alex and Maureen on their job searches. Please also continue praying for all of us that are looking for jobs in this uncertain job market. As mentioned, for Regina and Steve. As mentioned, for Doug and Monica and Maddie. For Denise, who lost a co-worker suddenly. For Bettie, who’s friend Amanda lost her husband. Pray also for her daughter as well. For all of us that need God’s Peace in our lives, whether it is because of some outside influence or for some other reason. All of those that would harm us. Please pray for those that need improvement in their finances, that they would ask God’s guidance in helping them through their difficult straights, and that He would help them get on track but also teach them to stay on track so they don’t have these issues again in the future. For my Mom, who had a birthday yesterday! For my Dad, and all he does for my Mom. For Charles, my leader, and for the men in our small group. For Russ and Jim as they lead us.